Hakusan, Japan, November 28, 2014 – EIZO Corporation (TSE: 6737) today announced the release of the RadiForce MX242W, a 24-inch color monitor for displaying electronic charts for clinical review. The RadiForce MX242W is the successor model to the MX241W and is equipped with the same great features for optimal image viewing including an IPS panel with wide viewing angles and EIZO’s brightness uniformity technology. The new monitor uses an LED backlight which saves 47% more energy and lasts significantly longer than conventional CCFL backlights. 5 years or 15,000 hours of usage time is guaranteed when the RadiForce MX242W is used at the recommended brightness of 180 cd/m2, ensuring optimal brightness stability over a long period of use. 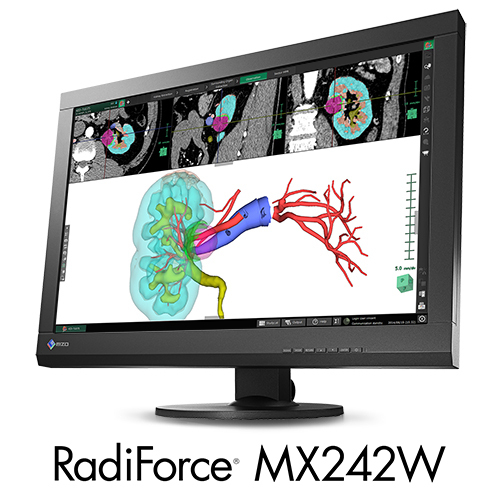 The RadiForce MX242W allows users to choose from various modes for supporting data from different modalities such as CR, CT, MRI, and endoscopy. Mode selection is conveniently accessed using the monitor’s front panel buttons. The widescreen 16:10 aspect ratio provides medical professionals with more horizontal space than conventional square monitors for keeping tool palettes open without covering important image information. The RadiForce MX242W is now shipping. Date of availability may vary by country so please contact the EIZO group company or distributor in your country for details.